The use of biomarkers in heart failure (HF) is a rapidly changing field. 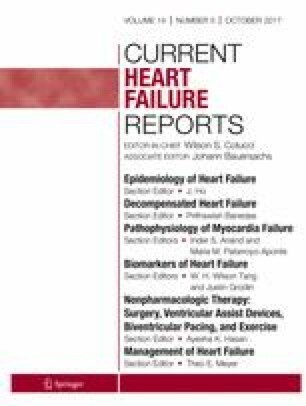 The purpose of this review is to assess the current evidence of the use of biomarkers for risk stratification in patients with HF with preserved ejection fraction (HFpEF). Despite differences in pathophysiology between HF with reduced ejection fraction and HFpEF, traditional HF biomarkers such as brain natriuretic peptide and troponin retain prognostic value in most HFpEF-specific populations. Biomarkers of key pathophysiologic components of HFpEF, such as myocardial fibrosis, remodeling, and systemic inflammation are also valuable prognostic markers. Further investigation into HF biomarkers may identify significant therapeutic targets for the treatment of HFpEF. The authors would like to thank Erin Campbell, MS, for her editorial contributions to this manuscript. Ms. Campbell did not receive compensation for her contributions, apart from her employment at the institution where this study was conducted. This manuscript was funded internally by the Duke Clinical Research Institute, Durham, NC. Jeremy Cypen and Tariq Ahmad declare that they have no conflicts of interest. Adam D. DeVore reports grants from the American Heart Association, Amgen, Novartis, as well as consulting with Novartis. Jeffrey M. Testani reports grants and personal fees from Otsuka, personal fees from Novartis, grants and personal fees from Sequana Medical, grants from Medtronic, grants and personal fees from Sanofi, grants from Boehringer Ingelheim, grants from the National Institutes of Health, grants from Corvidia medical, personal fees from GE Healthcare, personal fees from Cardionomic, grants and personal fees from The Foundry, grants from the US Food and Drug Administration, personal fees from Relypsa, and grants from Abbott. In addition, Dr. Testani has a patent Joint with Yale and Corvidia licensed. Okuyama R, Ishii J, Takahashi H, Kawai H, Muramatsu T, Harada M, et al. Combination of high-sensitivity troponin I and N-terminal pro-B-type natriuretic peptide predicts future hospital admission for heart failure in high-risk hypertensive patients with preserved left ventricular ejection fraction. Heart Vessel. 2017; doi: 10.1007/s00380-017-0948-9. DeVore AD, McNulty S, Alenezi F, Ersboll M, Vader JM, Oh JK, et al. Impaired left ventricular global longitudinal strain in patients with heart failure with preserved ejection fraction: insights from the RELAX trial. Eur J Heart Fail. 2017; doi: 10.1002/ejhf.754.